July 5, 2012- Air India Pilots on Wednesday have called off their 58 day strike after Delhi high court was given notice by the Indian Pilots' Guild (IPG) after a meeting of its managing committee in Mumbai that all 434 pilots would return to work within 48 hours. 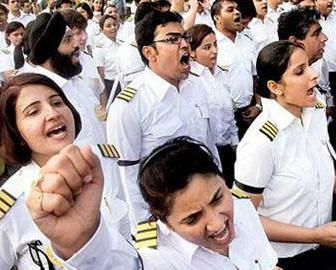 Air India the flag carrier airline of India pilots began their strike on May 7th, 2012, for better work conditions. IPG thanked the Indian judiciary and the high court "for mediating in this issue, which is critical to the survival of Air India and is in the national interest". On May 8th, 2012 about 100 pilots went on medical leave as a mark of protest while their talks with the management were still on. Later, the same day the company fired 10 pilots in what the company called what it called agitating pilots. The company soon de-recognized their union after 160 pilots failed to join duty by the given deadline. On the 15th of May, the Union Civil Aviation Minister Ajit Singh stated that the Government was giving Air India one last chance and that it must perform in order to qualify for a bailout. On May 26th, 2012 Aviation minister Ajit Singh announced that he would go ahead and hire new pilots if the strike did not end soon. While, AI management gave an assurance to Delhi High Court that it would look into the hardships of the pilots sympathetically, the striking pilots have decided to end the 58 day old strike immediately. Due to pilots' strike Air India suffered a loss of US$ 99.75 million in 45 days. Eventually, following the intervention of the Delhi High Court, the pilots called off their 58 day strike on 4th July, 2012. IPG general secretary E A Kapadia said "We the pilots of Air India and members of the Indian Pilots Guild, on the intervention of Honorable Justice Ms. Reva Khetrapal of the Honorable Delhi high court have started the procedure to resume work. "We sincerely hope that the AI management and the civil aviation ministry will be as sincere on their part. On this understanding, we are commencing the process of restoring normalcy of operations. During the courtroom proceedings, Justice Khetrapal said the pilots are not "goondas (hired thugs) or criminal elements. You consider their grievances after talking to them." The judge ordered Air India to hire back 101 pilots that were fired due to the strike and requested a report by July 9th on management’s efforts to create a "hostile environment", terminating pilots and the company’s actions to de-recognize the union. The court also ordered the pilots as well as management to appear before the conciliator, chief labor commissioner N K Prasad, on July 6 at 4.30pm. Air India stated "The AI management shall sympathetically consider the grievances of the pilots including the aspect of reinstatement of those pilots whose services were terminated as a consequence to their strike."